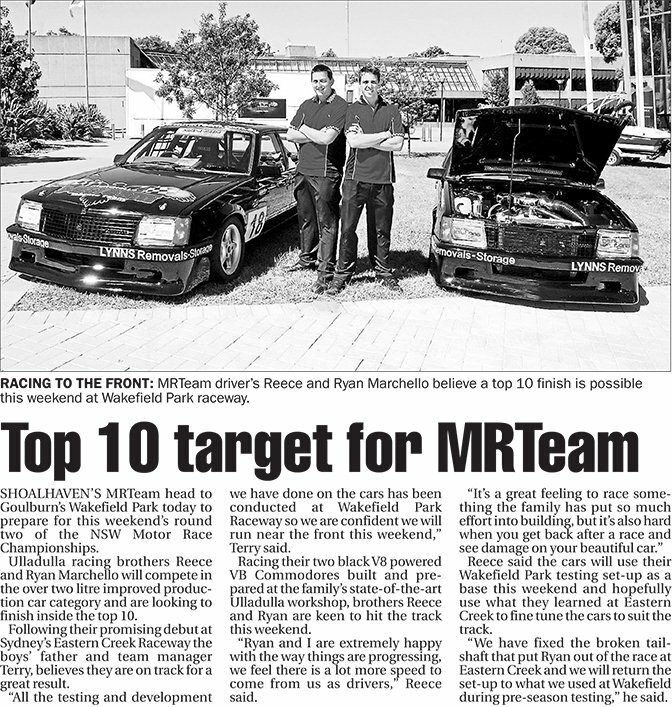 SHOALHAVEN’S MRTeam head to Goulburn’s Wakefield Park today to prepare for this weekend’s round two of the NSW Motor Race Championships. Ulladulla racing brothers Reece and Ryan Marchello will compete in the over two litre improved production car category and are looking to finish inside the top 10. Following their promising debut at Sydney’s Eastern Creek Raceway the boys’ father and team manager Terry, believes they are on track for a great result. Racing their two black V8 powered VB Commodores built and prepared at the family’s state-of-the-art Ulladulla workshop, brothers Reece and Ryan are keen to hit the track this weekend. “Ryan and I are extremely happy with the way things are progressing, we feel there is a lot more speed to come from us as drivers,” Reece said. Reece said the cars will use their Wakefield Park testing set-up as a base this weekend and hopefully use what they learned at Eastern Creek to fine tune the cars to suit the track. “We have fixed the broken tailshaft that put Ryan out of the race at Eastern Creek and we will return the set-up to what we used at Wakefield during pre-season testing,” he said.